It sounds like a splendid idea: Define a protocol that contains the complete information a graphics adapter needs to correctly drive a monitor, standardize this protocol as Extended Display Identification Data (EDID), use the monitor cable to transmit this information to the graphics adapter and let every monitor work with every graphics adapter auto-magically. any combination of the above applies. Duh, is computer hardware and firmware really that broken? Yes, it is. And Open Source does not help to improve it, since the monitor uses a proprietary system that still is not free as in freedom. In the good old days when the X server had its own configuration file and the Linux kernel used standard VGA commands to write to the console, lacking data could be supplied and wrong data repaired manually. With the advent of Kernel Mode Setting (KMS), the Linux kernel takes care of the initialization of the graphics adapter - in consequence, correct monitor data must be available to the kernel already while booting; the screen remains dark, otherwise. But since there is no configuration file, everything is based on the correct transmission of the EDID data set. The only solution was to completely disable KMS, but this disables accelerated graphics altogether. To force, for example, a screen resolution of 1280x1024/60 Hz, simply remove nomodeset from, add drm_kms_helper.edid_firmware=edid/1280x1024.bin to the kernel command, and enjoy a much faster screen and all the eye candy you missed so long. 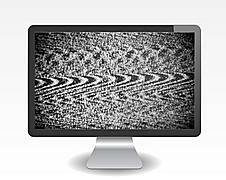 Some monitors, however, may require specific settings and do not work with the hard-coded standard data sets. Therefore, template source code and a make environment to build your own EDID data are available in the Documentation/EDID directory of the Linux kernel tree. There is also an instruction HOWTO.txt. This feature is available in the vanilla kernel as of version 3.4, but the related patch can be applied - with some offsets - to kernel versions 3.2 and 3.3 as well. How to force enabling or disabling a connector? One can only hope that kernel and X11 developers will come together soon and agree on a common name scheme of connectors.